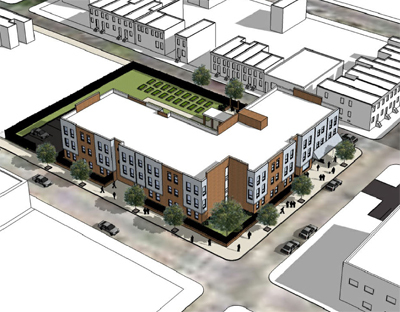 If all goes on schedule, a beautiful new 40-unit senior affordable housing development will be ready for occupancy by December 2015 in the Kensington section of Philadelphia. Catholic Health Care Services (CHCS) of the Archdiocese of Philadelphia is the lead sponsor, but it has been a team effort. 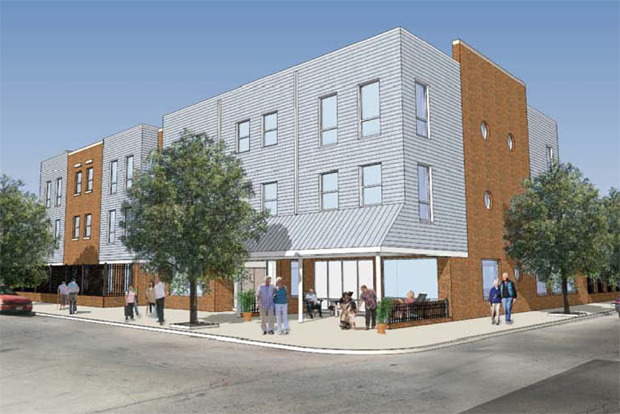 To bring this plan to reality, CHCS has been working closely with Catholic Human Service’s Office for Community Development (OCD), St. Francis Inn, Visitation B.V.M. Parish and the East Kensington Neighborhood Association. The preliminary development budget is $11.9 million made possible largely through a Pennsylvania Housing Finance Agency tax credit award received this February. To obtain the credits the archdiocese will team with other entities that have large tax liabilities to which the credits can be applied. “On hearing the news of this award, my reaction was a combination of pride in the work of our staff, balanced with the realization that once again our organization will step up to the plate on behalf of the seniors in this area,” said Joseph J. Sweeney, Jr., secretary for Catholic Human Services of the archdiocese. The apartment units of the 38,780 square foot building, according to plans filed with the city, range between 588 and 633 square feet and include a living/dining area, bedroom, bath and kitchen. The three-story L-shaped building will also include laundry and lounge areas, elevators, a community room, and office space for the site manager and social worker. 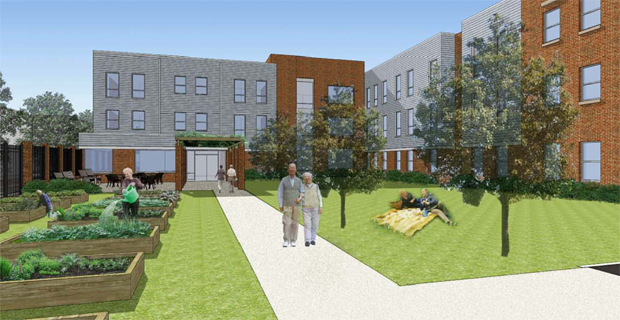 The fenced, lighted and landscaped exterior will include a porch, outdoor terrace and gardening area, as well as a small parking area, sufficient for the needs of a senior housing development. St. Francis Villa will serve a population 62 years and older with an income that is at least 40 percent below the median income for the area. Residents will pay 30 percent of their income toward the rent, with the balance covered by government subsidy. Among the first to advocate new senior housing in the area was Franciscan Father Michael Duffy at nearby St. Francis Inn, which has been providing outreach to the poor in Kensington since 1978. “Having affordable senior housing has been a long-time dream of ours,” Father Duffy said. Architects for St. Francis Villa are Cecil Baker & Partners. Domus and Co. will be the general contractors for construction, scheduled to begin January 2015. “The undertaking is consistent with the work and mission of Catholic Human Services of the Archdiocese of Philadelphia,” said John Wagner, director of the Office for Community Development at the Secretariat for Catholic Human Services. Wagner points to the fact that St. Francis Villa is just the latest initiative by the archdiocese established to improve the quality of life in Kensington. For example there is Visitation Homes, which provides transitional housing to 19 mothers with children as they move from homelessness to permanent housing; and the Cardinal Bevilacqua Community Center, which provides a host of learning, cultural and sports programs geared to teens. Redemptorist Father Bruce Lewandowski was pastor of Visitation Parish during the planning stages of St. Francis Villa when the concerned parties were looking for various ways to improve the Kensington neighborhood. After Father Duffy at St. Francis Inn mentioned the need for good affordable housing, as a group it was determined this could best be accomplished with the archdiocese having a lead role because of its experience in the field. As Wagner noted, East Kensington is a changing neighborhood. The change is gradual, it is true, but changing. Tracing its history all the way back to its beginnings in the very early 19th century, Kensington was home to the working men and women who toiled in the textile mills, especially carpet mills that were the life blood of the neighborhood. When the textile industry was exported to China and other points east and south, Kensington sank into deep recession with all of the social ills that go hand-in-hand with poverty. Now there are signs of gentrification finally arriving. That, however, is little help to the truly poor because they are mostly renters, not owners. Gentrification simply means they will be forced out by higher rents. Places like St. Francis Villa help counter that, but tax credit deals are hard to come by, as Wagner knows, because he has been working on this particular one for several years. He doesn’t take the credit for it but insists it has been a concerted effort by many, not least among them Joseph Sweeney, Bishop John McIntyre and Archbishop Charles Chaput. “They made it possible,” Wagner said. I live in the neighborhood and would like to know who I could contact about possible positions of employment. If anyone could help me I would greatly appreciate the help. This is WONDERFUL news! The Friars have done a fantastic ministry in this area (through their presence especially at St. Francis Inn)despite odds in the early days and surmounting many hurdles on the path ever since. Not only do they provide food, etc. for the body but also much in helping people maintain or regain their human dignity. Bravo for all those involved in this project.